Building Integrated Agriculture can provide more than just fresh, local food. Integrating vegetation into buildings can improve energy management, air quality, interior comfort and worker productivity. With its high yields and efficient use of resources, urban hydroponic food production also provides urban food security and eases pressure on the environment from conventional agriculture. As the planet becomes increasingly urbanized, and the density of developed areas increases, the natural world is being displaced, pressured and marginalized. The ground is a diminishing percentage of the built area of a city, and it becomes more remote from people as they live and work in ever-taller structures. In this context, vertical surfaces are an untapped opportunity to bring nature into the built environment. 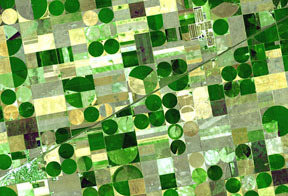 Modern field agriculture is the largest consumer of land and water on the planet, the source of most water pollution, and the cause of 15% of the world’s greenhouse gas emissions. Three major trends: increasing global population, movement of populations to urban areas, and global warming, will increasingly strain the global food system over the next half-century, leading to widespread shortages of food, water and arable land by 2050. Transportation and storage: Fresh vegetables come to the city at a particularly high ecological price. In New York City, the average supermarket item has traveled 2500 km to reach the consumer, and in the case of fresh produce, this trip has to be made particularly quickly, with refrigeration en route, even though well over 90% of the product is simply water. Studies have also shown that 40% of the ecological footprint of a city is from food production and transport. 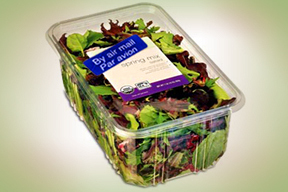 transporting vegetables is difficult because they are delicate, consist mostly of water, and need refrigeration. Solutions: These challenges – essentially, the need of humans for sustenance, shelter and nature – are inherently linked and that therefore, their solutions may also be linked, through direct integration of food supply into the built environment. 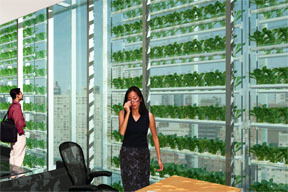 Growing crops on buildings has the potential to confer a host of benefits including a reduced environmental footprint, reduced transportation costs, greater food security, enhanced energy management of the building envelope, and perhaps most significantly, improved physical and psychological comfort for building occupants. Vertical farms have been proposed by our friend and colleague Dickson Despommier and others as a solution to this crisis. (see www.verticalfarm.com ) Our approach is somewhat different from the ambitious concept of the standalone, all-food producing urban farm - more limited and immediately practical. We’d like to integrate food production into buildings, specifically growing hydroponic crops in building envelopes, facades and roofs. As well as the benefits of food production, this provides benefits to the building and occupants through reduced energy costs and connection to nature, and makes the best use of available solar energy. 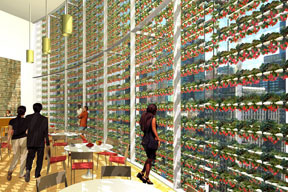 The Vertically Integrated Greenhouse (VIG) is a highly productive, lightweight, modular, climatically responsive vegetable culture system designed to be installed in the curtain wall of a high rise building. The system is achievable with extant technology and draws from modern advances in both hydroponic methods and building design. The design was developed in 2007 by Kiss + Cathcart with Arup, Engineers and Bright Farm Systems (www.brightfarmsystems.com). 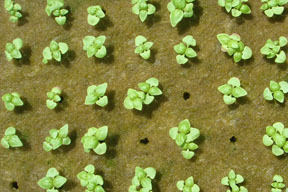 Hydroponics, the culture of plants in water, is a commercially common, well developed practice. It has been publicly demonstrated, by commercial growers, and by New York Sunworks Science Barge in Manhattan (link www.nysunworks.org) that ecologically sensitive, recirculating hydroponics produces premium quality vegetables and fruits using ten to twenty times less land and five to ten times less water than conventional agriculture, while eliminating chemical pesticides, fertilizer runoff, and carbon emissions from farm machinery. 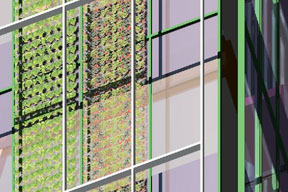 Double Skin Facade: In the building sector, the double skin facade (DSF) is an innovation which can substantially reduces energy use and increase interior comfort in high rise buildings by providing a second layer of glazing, typically on the southern facade, creating a vertically continuous void space. A DSF provides solar heat gain, buoyancy-driven cooling flows, protection for external solar shades, and sound insulation. A DSF also enables opening windows, a convenience that enhances personal comfort and local climate control, but is unavailable on conventional high-rise facades due to wind pressure and stack effect. Despite these advantages and a certain popularity in Germany and other areas of Northern Europe, the DSF still stands on the brink of widespread adoption but remains constrained by economic concerns. 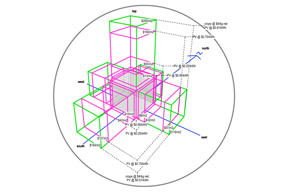 System Description: The Vertically Integrated Greenhouse design integrates hydroponic food production into a DSF, for installation on new high-rise buildings and potentially as a retrofit on existing high-rise buildings with adequate southern exposure. A south facing vertical facade at northern latitudes admits a fairly even distribution of sunlight throughout the year. Solar radiation is highest in winter, when produce prices peak. 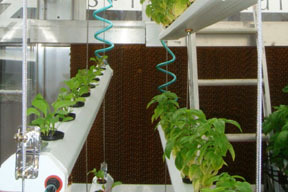 Plants are grown on trays suspended by a simple cable system, and all planting and harvesting occurs at the bottom level. Systems modules can rise as high as 10 or 20 stories each. 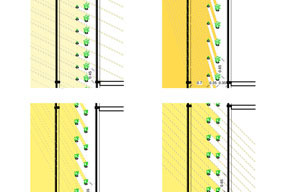 An adaptive control system alters the angles between rows of plants in the manner of Venetian blind, maximizing solar absorption diurnally and seasonally. Integration with HVAC System: The VIG provides the building designer with an additional tool for managing energy demand and occupant comfort, through integration with the building’s HVAC system. A wide number of potential operating modes exist, but some of the most significant are illustrated in Arup’s diagram. In winter, the VIG is an effective solar capture device, warming and insulating the glazed facade of the building. On winter nights, exhaust air from the building can be ducted to the VIG to maintain plant temperatures. In summer, the VIG shades the interior of the building, and provides a source of fresh air to occupants with opening windows. 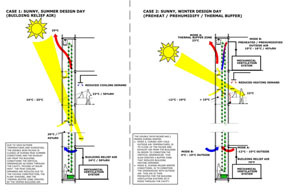 The VIG reduces solar heat gain by absorbing energy as latent heat, through transpiration. The VIG also mitigates the urban heat island effect like a green roof. The integrated VIG / building system is complex but has a host of benefits we have only begun to analyze and quantify, including carbon dioxide / oxygen transfer and cleaning of the building air, possibly allowing lower ventilation rates. 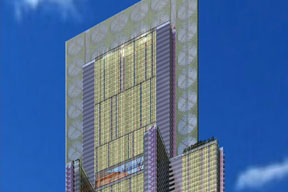 Yields: We modeled the VIG on our hypothetical design, the 2020 tower, for a New York City location. To deploy the VIG across a facade 60 m wide for 50 floors of the tower would take 135 modules (2m wide, 1.5m deep and 40m high) producing over 400 tons of crop annually, slightly exceeding the total fresh vegetable consumption of all of the 3,000 tenants occupying those floors. Beyond the value of the produce, energy benefits and human productivity benefits, the ecological value of local food production is substantial. Each of the 135 modules in this system would conserve 300 tons of fresh water per year, avoid up to 3.75 tons of CO2 emissions, and replace 1/10th of a hectare of cropland, reducing habitat impact and agricultural runoff. Finally, no chemical pesticides will be necessary in the VIG.